On this visit to Spice Road Table, we had big Nabil again. We weren’t seated by the window, but instead in one of the curved banquettes (sorry, the lighting isn’t as good for photos, and note: if you’re overheated, these aren’t very cool temperature-wise and there isn’t much air circulation). 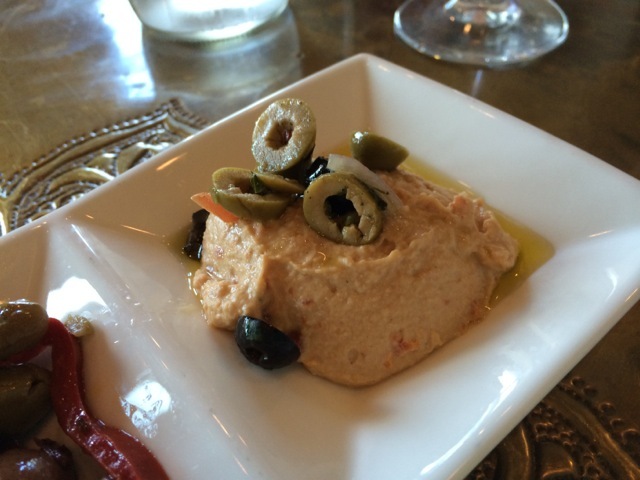 I had a glass of the Queen of Hearts White (remember, I had this with the Hummus and Olives the first time). Nick had a bottle of the Estrella Damm Daura… This was really good on a hot day, it has well rounded sweetness and some hops. Note: the music was louder than usual and not as Westernized… perhaps because there’s a different manager on duty. The tomato flavor wasn’t as prominent this time around. Both the wine and the beer went well (again). 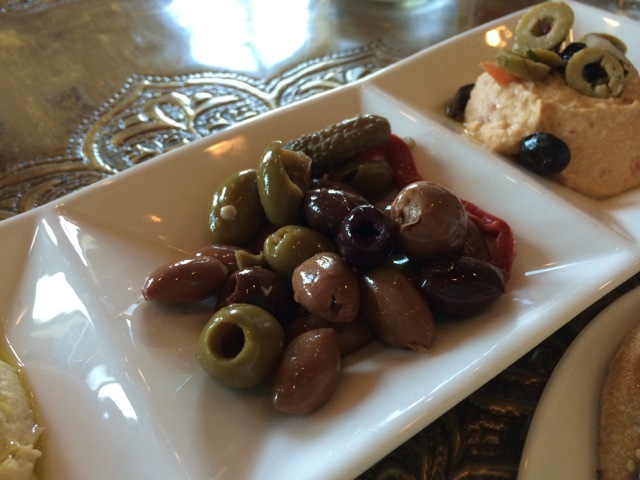 There were a few strips of roasted red pepper in our olives this time, yum. I thought Nick wouldn’t want any so I gobbled them all up. Then he asked me why I didn’t leave him any, oh well, I’ll know next time to give him some (ha ha ha, I thought he didn’t care for roasted red pepper). There was one cornichon (I didn’t eat it! I was certain that he liked them!). 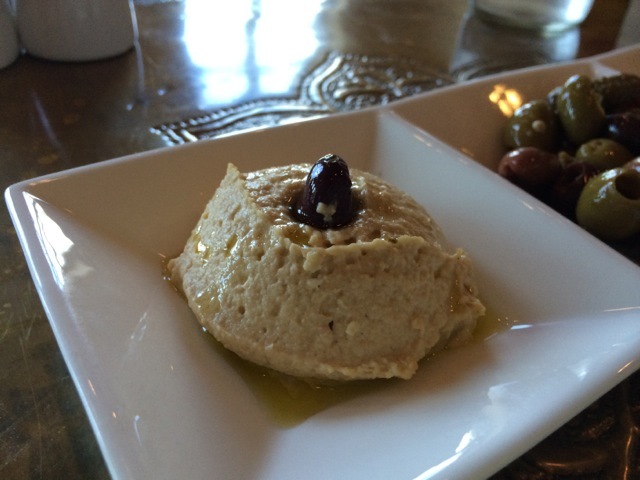 The Hummus and Olives are a really good “starter” tapas – in two ways, (1) if you aren’t sure that you’re going to like the offerings at Spice Road Table, this dish is pretty simple and easy, and (2) if you’re hungry and hot, this dish is nice and refreshing and lets you satiate that hunger and cool down before going with something spicy or hot. The pita is whole wheat, this means that the texture is slightly more coarse than the soft white pita served inside Tangerine Cafe (makes sense, the pita in Tangerine Cafe is mainly for wraps and sandwiches, as such, it needs more flexibility. 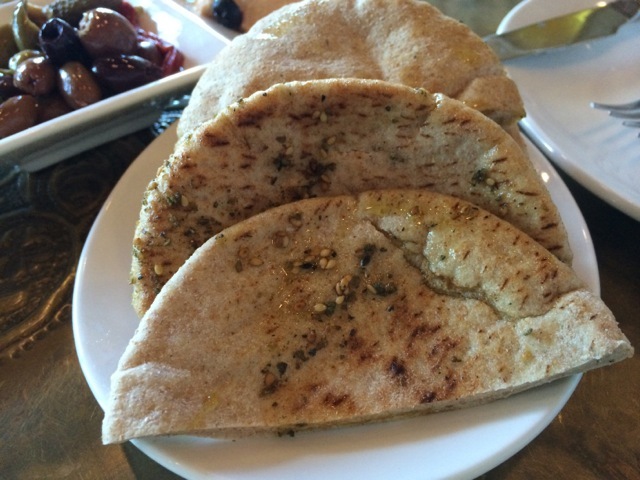 Nabil brought us extra pita so that we could enjoy all of the hummus and olive oil in the dish – yum. 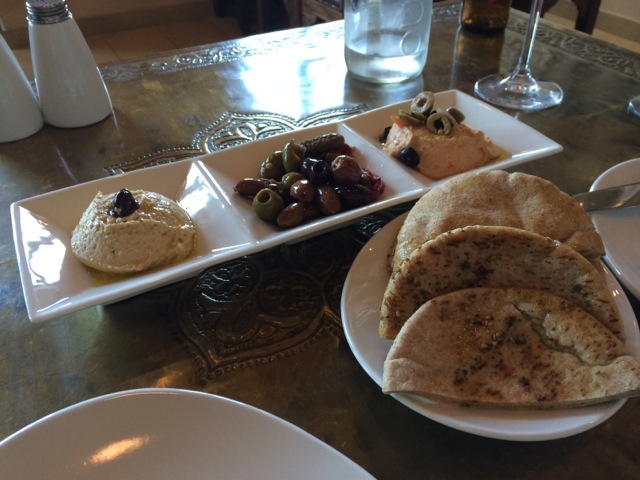 Okay, now I’m hungry for hummus and olives and pita. Sigh, maybe this afternoon I’ll be able to get some <smiles>.